Alpinestars &###x2013; Stella SMX 2 Air Carbon Motorcycle Gloves v2 Black &###x2013; L. Designed and developed for an optimized womens fit. Newly designed and durable, multi-panel main shell construction incorporating full-grain leather and 3D mesh for durability, abrasion resistance and high levels of breathability. An innovative microfiber and PU grip insert strategically position on palm and thumb for excellent levels of grip control and durability. Ergonomically shaped Alpinestars innovative carbon knuckl guard provides exceptional impact and abrasion protection. Guard is reinforced on the interior side with thick EVA foam for improved levels of fit, comfort and shock absorption. Touchscreen compatible index fingertip and thumb for use with smartphones and GPS systems. Alpinestars Stella SMX-2 Air Carbon V2 Leather/Textile Ladies Gloves – Black Featuring an evolutionary innovative design and cutting-edge material construction to enable it to achieve the highest CE certification standards, the Stella SMX-2 Air Carbon V2 Glove features carbon knuckle guards, a technical 3D mesh and leather main shell construction to provide excellent levels of protection and cooling airflow for those hot summer days cutting through the downtown traffic. CONSTRUCTION – Designed and developed for an optimized womens fit. Newly designed and durable, multi-panel main shell construction incorporating full-grain leather and 3D mesh for durability, abrasion resistance and high levels of breathability. An innovative microfiber and PU grip insert strategically position on palm and thumb for excellent levels of grip control and durability. Alpinestars exclusive ergonomic stretch insert between palm and thumb offers improved range of hand movement and greater sensitivity while operating the bike controls. Incorporates premium quality suede palm and landing reinforcement for grip, control and durability. Ergonomically shaped Alpinestars innovative carbon knuckl guard provides exceptional impact and abrasion protection. Finger tops and back hand incorporates poly mesh TPR inserts for additional impact abrasion and ventilation in critical areas. Impact absorbing EVA foam panels on thumb for additional impact performance. 3D mesh finger surfaces and thumb for cooling performance. Pre-curved finger construction to reduce riding fatigue. Neoprene wrist cuff plus velcro and TPR closure for secure and personalized closure. Touchscreen compatible index fingertip and thumb for use with smartphones and GPS systems. The item “Alpinestars Stella SMX 2 Air Carbon Motorcycle Gloves v2 Black L” is in sale since Sunday, November 18, 2018. This item is in the category “Vehicle Parts & Accessories\Car Parts\Air Intake & Fuel Delivery\Air Filters”. The seller is “a-sales-group” and is located in Manchester. This item can be shipped to United Kingdom, Austria, Belgium, Bulgaria, Croatia, Cyprus, Czech republic, Denmark, Estonia, Finland, France, Germany, Greece, Hungary, Ireland, Italy, Latvia, Lithuania, Luxembourg, Malta, Netherlands, Poland, Portugal, Romania, Slovakia, Slovenia, Spain, Sweden, Australia, United States, Canada, Brazil, Japan, New Zealand, Israel, Hong Kong, Norway, Indonesia, Malaysia, Mexico, Singapore, South Korea, Switzerland, Taiwan, Thailand, Chile. Posted on March 1, 2019 by admin	in alpinestars. Tags: alpinestars, black, carbon, gloves, motorcycle, stella. 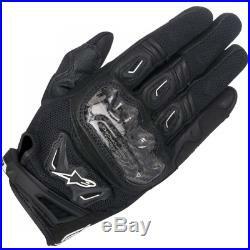 Alpinestars &###x2013; Stella SMX 2 Air Carbon Motorcycle Gloves v2 Black/White &###x2013; L. Designed and developed for an optimized womens fit. Newly designed and durable, multi-panel main shell construction incorporating full-grain leather and 3D mesh for durability, abrasion resistance and high levels of breathability. An innovative microfiber and PU grip insert strategically position on palm and thumb for excellent levels of grip control and durability. Ergonomically shaped Alpinestars innovative carbon knuckl guard provides exceptional impact and abrasion protection. Guard is reinforced on the interior side with thick EVA foam for improved levels of fit, comfort and shock absorption. Touchscreen compatible index fingertip and thumb for use with smartphones and GPS systems. Alpinestars Stella SMX-2 Air Carbon V2 Leather/Textile Ladies Gloves – Black/White Featuring an evolutionary innovative design and cutting-edge material construction to enable it to achieve the highest CE certification standards, the Stella SMX-2 Air Carbon V2 Glove features carbon knuckle guards, a technical 3D mesh and leather main shell construction to provide excellent levels of protection and cooling airflow for those hot summer days cutting through the downtown traffic. CONSTRUCTION – Designed and developed for an optimized womens fit. Newly designed and durable, multi-panel main shell construction incorporating full-grain leather and 3D mesh for durability, abrasion resistance and high levels of breathability. An innovative microfiber and PU grip insert strategically position on palm and thumb for excellent levels of grip control and durability. Alpinestars exclusive ergonomic stretch insert between palm and thumb offers improved range of hand movement and greater sensitivity while operating the bike controls. Incorporates premium quality suede palm and landing reinforcement for grip, control and durability. Ergonomically shaped Alpinestars innovative carbon knuckl guard provides exceptional impact and abrasion protection. Finger tops and back hand incorporates poly mesh TPR inserts for additional impact abrasion and ventilation in critical areas. Impact absorbing EVA foam panels on thumb for additional impact performance. 3D mesh finger surfaces and thumb for cooling performance. Pre-curved finger construction to reduce riding fatigue. Neoprene wrist cuff plus velcro and TPR closure for secure and personalized closure. Touchscreen compatible index fingertip and thumb for use with smartphones and GPS. 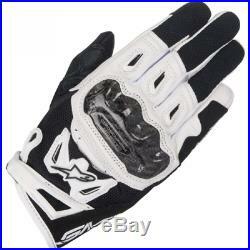 The item “Alpinestars Stella SMX 2 Air Carbon Motorcycle Gloves v2 Black/White L” is in sale since Sunday, November 18, 2018. This item is in the category “Vehicle Parts & Accessories\Car Parts\Air Intake & Fuel Delivery\Air Filters”. The seller is “a-sales-group” and is located in Manchester. This item can be shipped to United Kingdom, Austria, Belgium, Bulgaria, Croatia, Cyprus, Czech republic, Denmark, Estonia, Finland, France, Germany, Greece, Hungary, Ireland, Italy, Latvia, Lithuania, Luxembourg, Malta, Netherlands, Poland, Portugal, Romania, Slovakia, Slovenia, Spain, Sweden, Australia, United States, Canada, Brazil, Japan, New Zealand, Israel, Hong Kong, Norway, Indonesia, Malaysia, Mexico, Singapore, South Korea, Switzerland, Taiwan, Thailand, Chile. Posted on March 1, 2019 by admin	in alpinestars. Tags: alpinestars, blackwhite, carbon, gloves, motorcycle, stella.